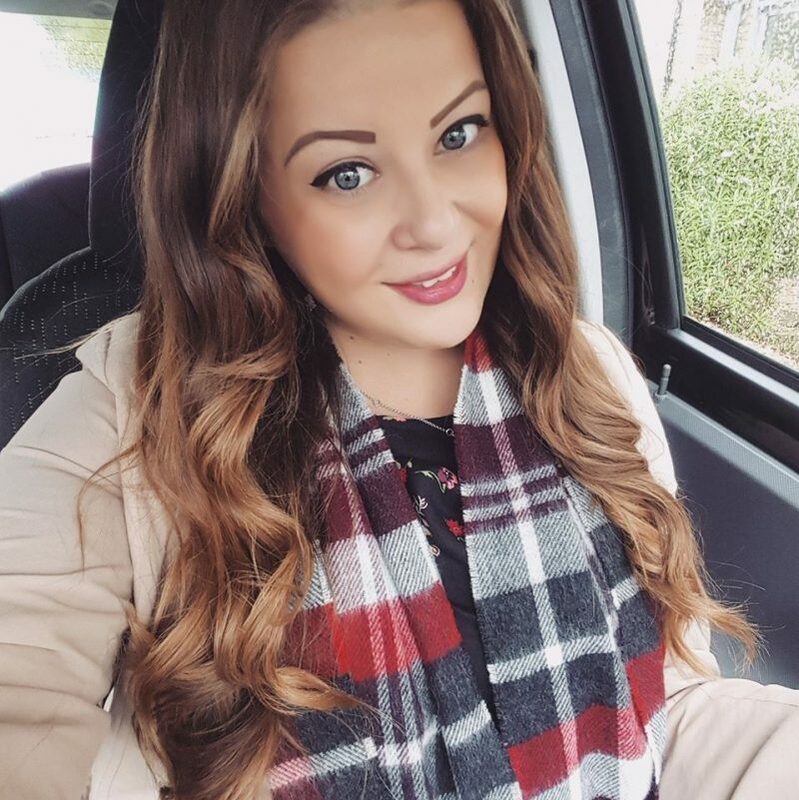 Sorry for my recent blogging disappearance! I’ve been so busy this month because as I mentioned in my last blog post, I’ve just bought my first home! So I’ve been busy doing it up and making it mine, and it’s now almost finished. Luckily it was in pretty good nick to begin with but it just needed a lick of paint and a few little things doing. I thought I’ll probably do a little blog post on each room (it’s only a 1 bed place!) and first of all I’d like to show you my little kitchen!For my latest updates, follow me on Instagram! The kitchen is quite small but is perfectly adequate for my needs.. I’m not a great chef! I like that the kitchen cabinets are plain white with sleek silver handles; nice and simple. 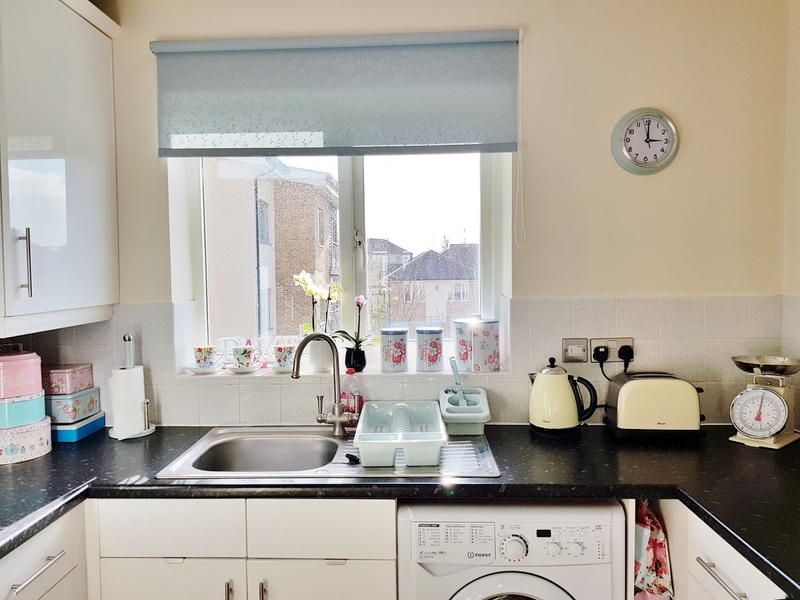 The worktop has a black pattern which I don’t mind too much, but I am not keen on the tiles. They are white with blue/grey specks on them? They look quite industrial (horrible) in my opinion and I wish I could change them, but for now they will have to do. As a quick fix I did consider painting them but a lot of people seem to think this doesn’t leave a nice finish, so I think they’re safest just left alone for now until I can re-tile. The flooring is a boring wooden look vinyl which again is fine, but I will probably get round to doing something a bit nicer in future. the short term as it saves me a good few hundred pounds. The fridge fits neatly inside the big cupboard which keeps it hidden which I like. 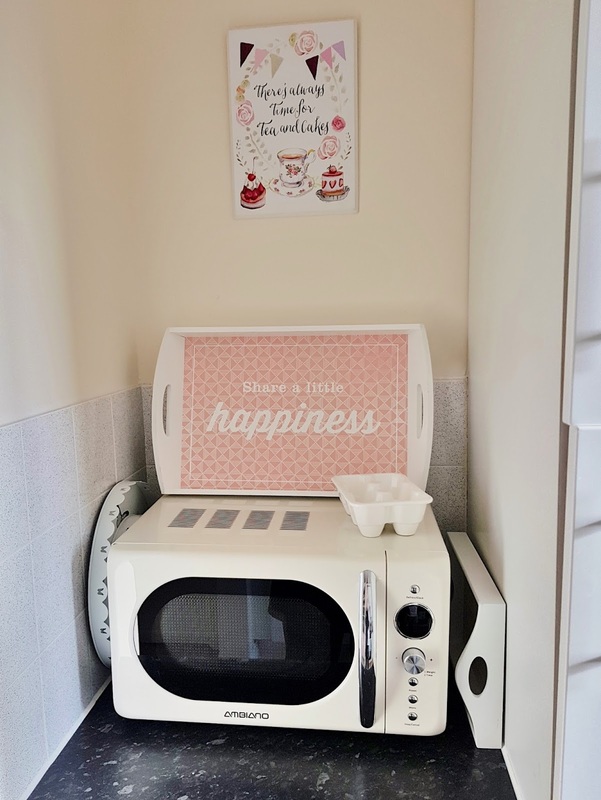 I did buy myself a cute little microwave though which was a bargain for only £40 from Aldi during one of their special deal! 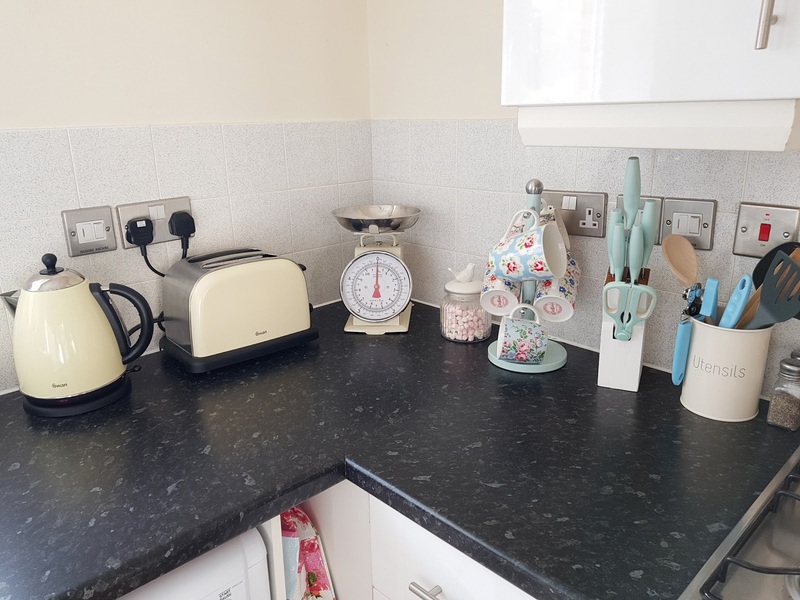 I wanted a cream one to match my kettle and toaster and it fits really nicely in the little gap between the wall and the fridge. Plus it makes a nice little corner to accessorize with my trays and little bits and pieces! The left side of the kitchen isn’t very exciting as there’s the big cupboard for the fridge plus another big cupboard which contains my boiler *yawn*. Annoyingly, some work had been done on the boiler just before I bought it so there are pipes and bits hanging out which look horrible and untidy! I’ve tried covering them up with some pretty cake tins for the time being because I couldn’t stand the sight of it. 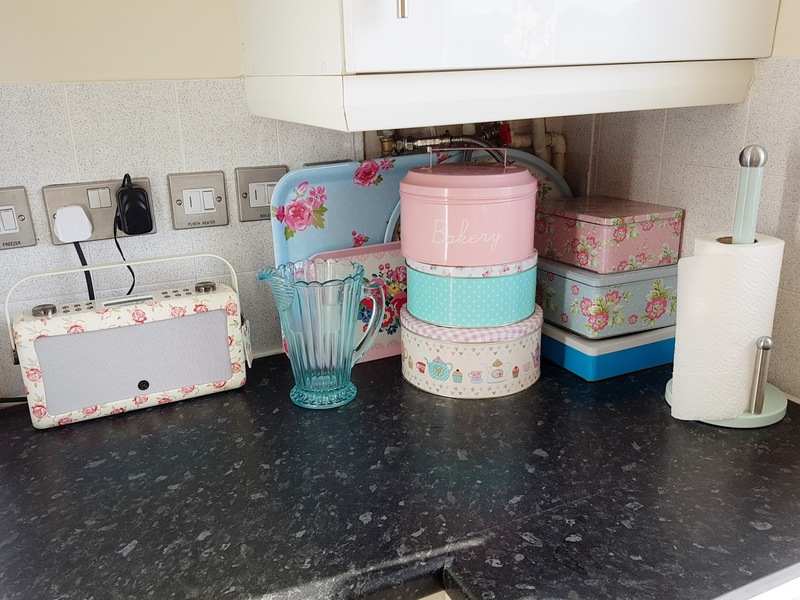 I’ve also set up my lovely Emma Bridgewater digital radio in the kitchen too so I can listen to music whilst I cook! The view from the kitchen window isn’t very exciting as it’s mainly our residential car park but to ensure privacy I’ve put up this gorgeous new blind from Make My Blinds! This print is called the ‘Nina’ which is a stunning shade of duck egg blue with a dainty silver print on it. I absolutely love the blind and it matches some of my accessories beautifully! 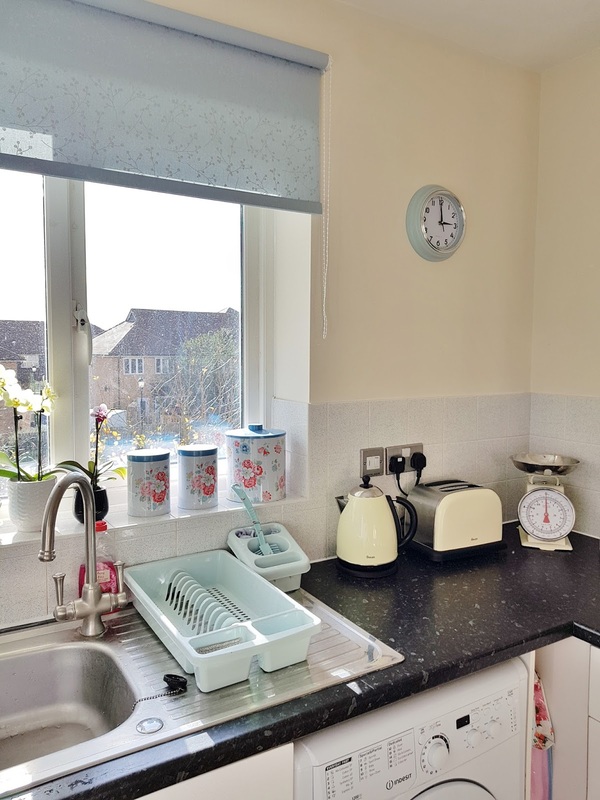 The blinds are made to measure so they can fit any sized window and you know they will be the perfect fit. 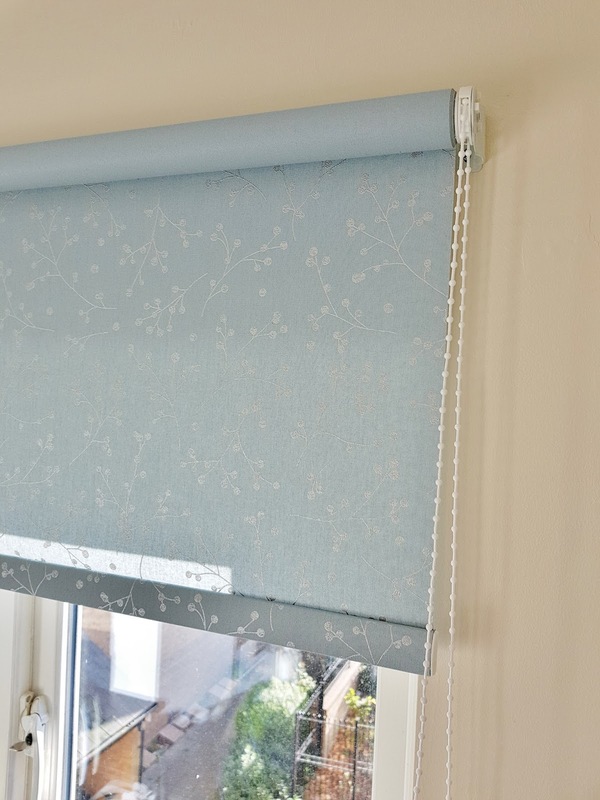 I’m so pleased with my blind, it’s such a quick and easy way to transform the room. On the windowsill I’ve put a few of my favourite Cath Kidston tea cups along with some pretty mini orchids that my friends bought me, and my Cath Kidston canister tins which will be used for tea/coffee (not that I drink it!). The duck egg blue dish drainer and cutlery drainer are just from Home Bargains but were only about £1 each so a steal! I also got the kitchen roll holder, clock, and mug tree from the same range too, so it’s all matching. 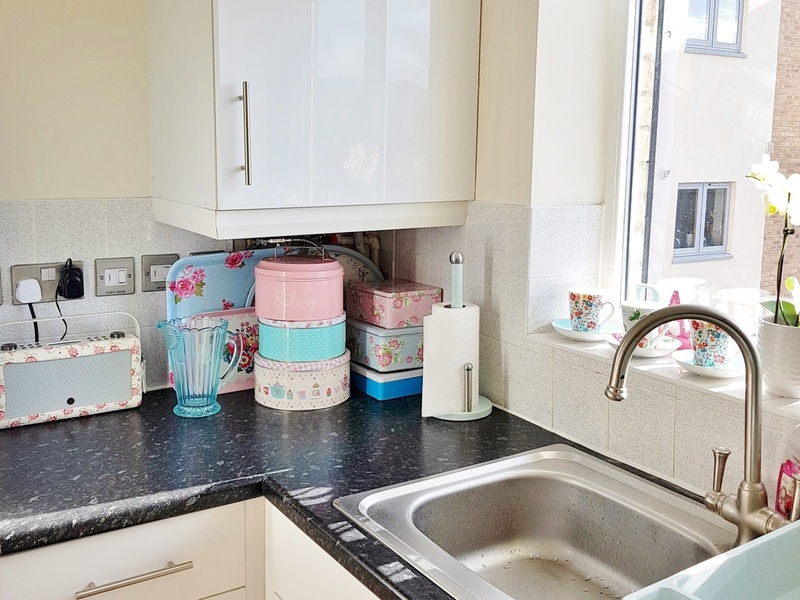 On the other side of the kitchen I have my cream coloured kitchen accessories (kettle, toaster, and scales) which are all a matching cream colour. I also have a little jar of mini marshmallows (for my hot chocolates! 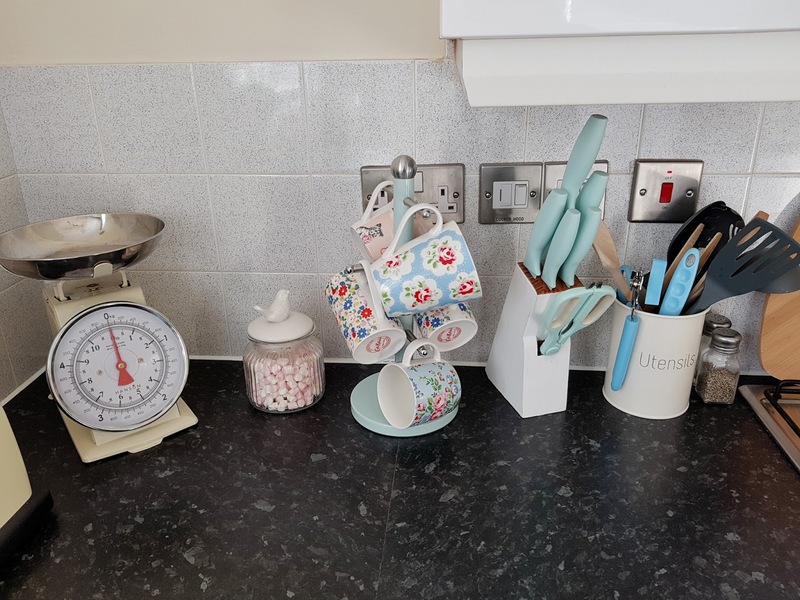 ), a mug tree for (just some of) my Cath Kidston mugs, a knife block, and a utensil holder. 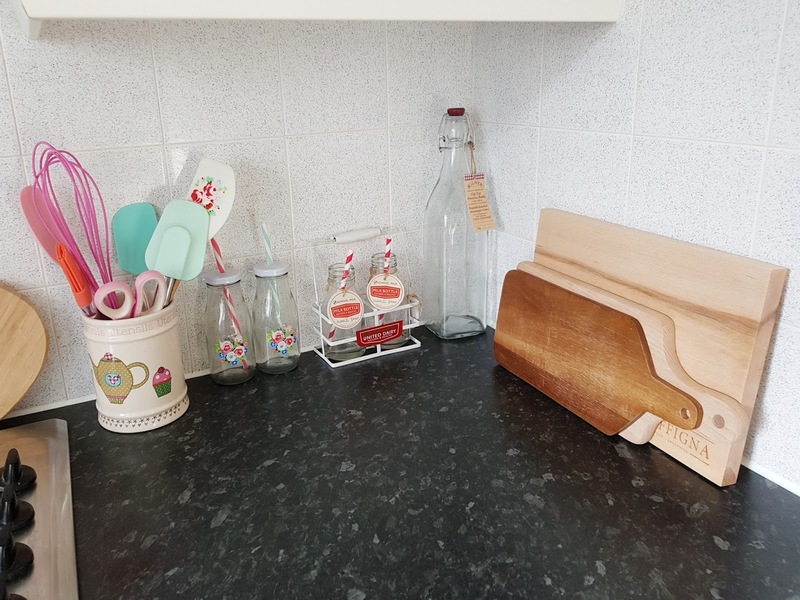 I spent ages looking for a cream coloured knife block that would match the other bits but I couldn’t find a nice one and I didn’t want to spend more than £30. In the end I bought a set of 5 duck egg blue knives from Home Bargains for £5, the matching scissors for £1 and put them in my old knife block that I had from uni! The big knife doesn’t really fit, but I gave it a lick of white paint and now I actually quite like it! I also tried to get some ‘nice’ utensils but they’re all pretty ugly, so I ended up just getting some cheap plastic ones and some nice blue bits (cork screw, pizza cutter, can opener etc) from Poundland, and just stuck them all in the cream utensil pot from Home Bargains (aka best shop ever). I had never used a gas hob before but now I have one I’ve had to get used to it! It’s a bit weird and I don’t really get why it exists but it works fine I guess, although is annoying to clean. 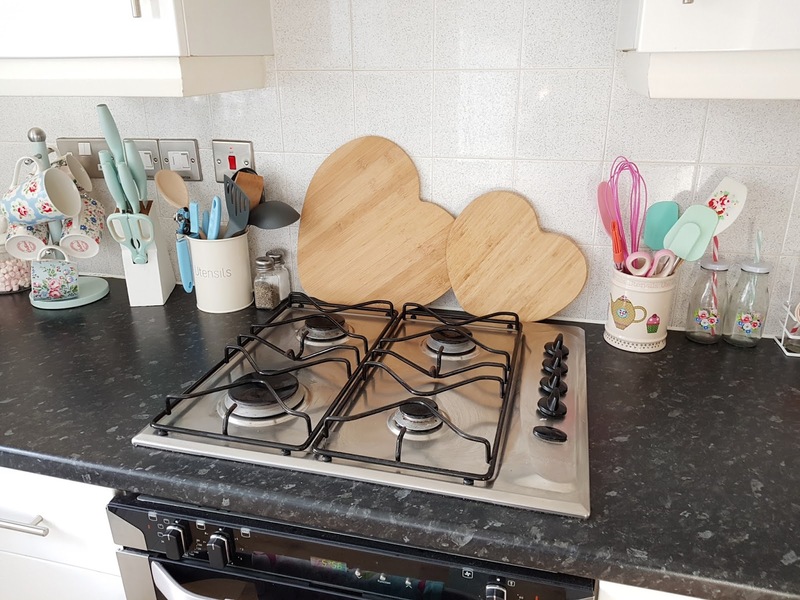 I have a couple of cute heart shaped wooden chopping boards resting against the hob, and then another utensils pot which holds my silicone baking tools. I also have a corner with not much in at the moment except for some milk bottles and more chopping boards, but I’m sure I will find better use for that space soon! And finally, I just thought I’d give you a little glimpse of my kitchen cupboards! 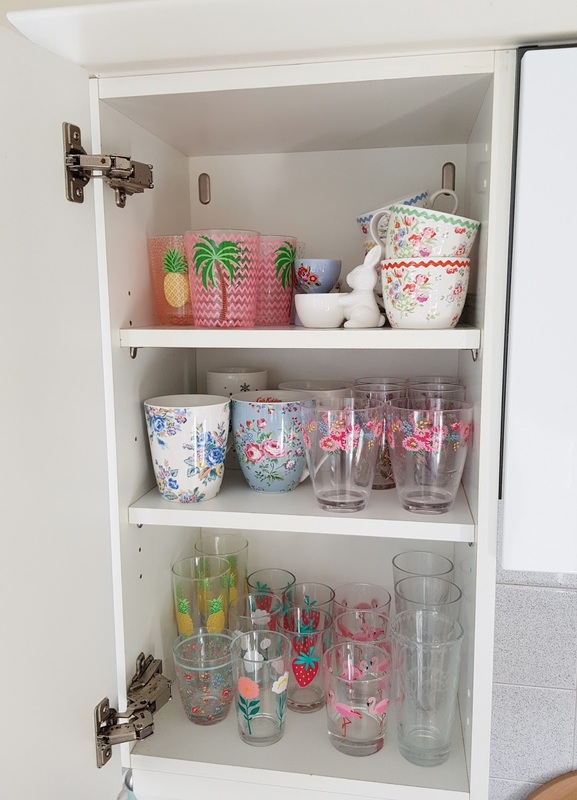 My glasses cupboard holds all my pretty drinking glasses (no plain ones here! ), mugs, and egg cups. 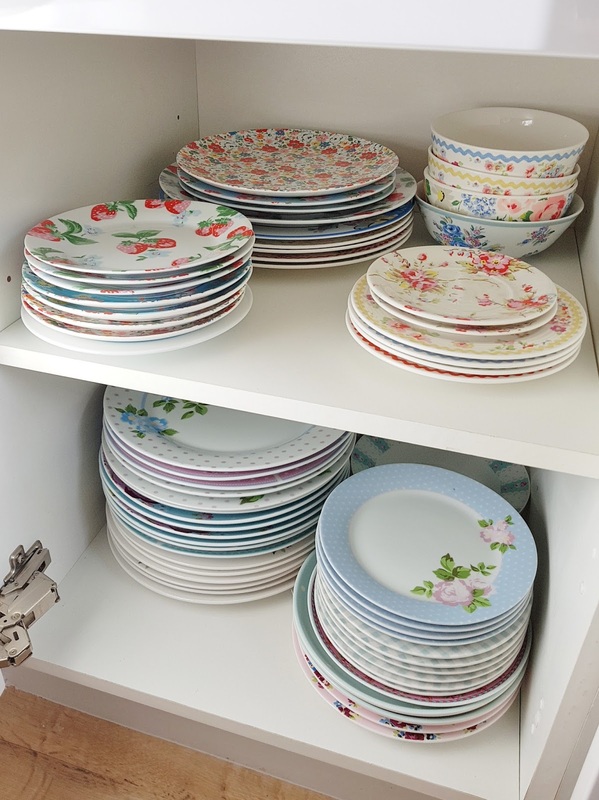 And then I have the plate cupboard which has a top shelf purely for Cath Kidston crockery (I’m weird, I know) and then the bottom shelf is other pretty plates. None of my crockery is plain.. it’s ALL floral! I have been collecting stuff since I was 18 so that’s almost 10 years of collecting house things and forgetting what I have so ended up buying loads. At least I won’t run out of plates! Overall, I think it’s kinda cute! I hope you enjoyed my little kitchen tour. Don’t forget to follow me on Instagram! Previous Post Sneak Peek into my new Home! Love them heart shape chopping boards, they caught my eye instantly! 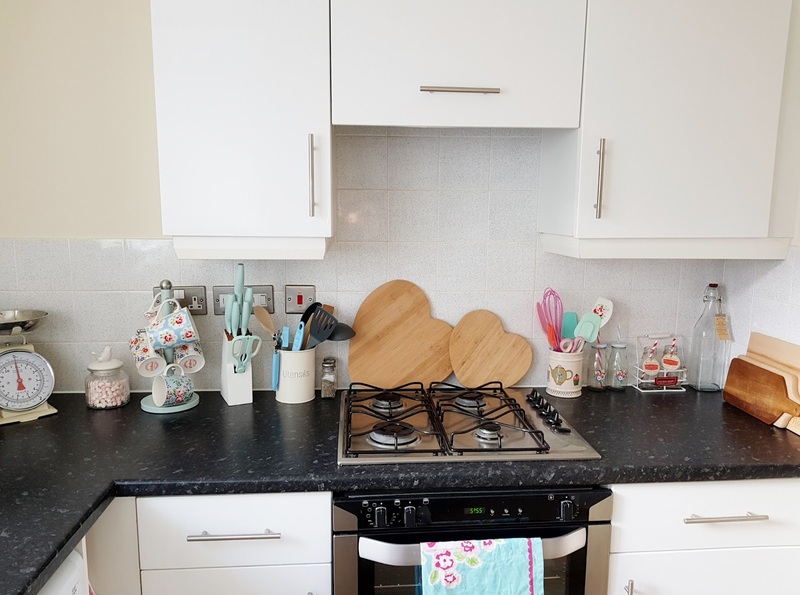 You've made a fantastic job of your kitchen, it looks lovely!